Ferguson, Missouri police officer Darren Wilson, who fatally shot unarmed teenager Michael Brown earlier this month, has gone underground since the controversial shooting, but his backers have been coming out in droves and many are showing their support by donating cash online. Almost $400,000 has been raised on the fundraising site gofundme.com for the six-year police veteran. After the first fundraising drive reached its goal of $234,000, a second page was established and has brought in more than $153,000 in four days. More than 9,000 people combined have contributed to the two fundraising pages. By contrast, more than 8,600 people have donated about $250,000 to the gofundme page set up for Brown. Thousands of mourners attended Brown's funeral Monday in St. Louis. Brown's Aug. 9 killing ignited almost two weeks of racially charged street protests in Ferguson. The young man was unarmed when he was shot by Wilson, who is white. 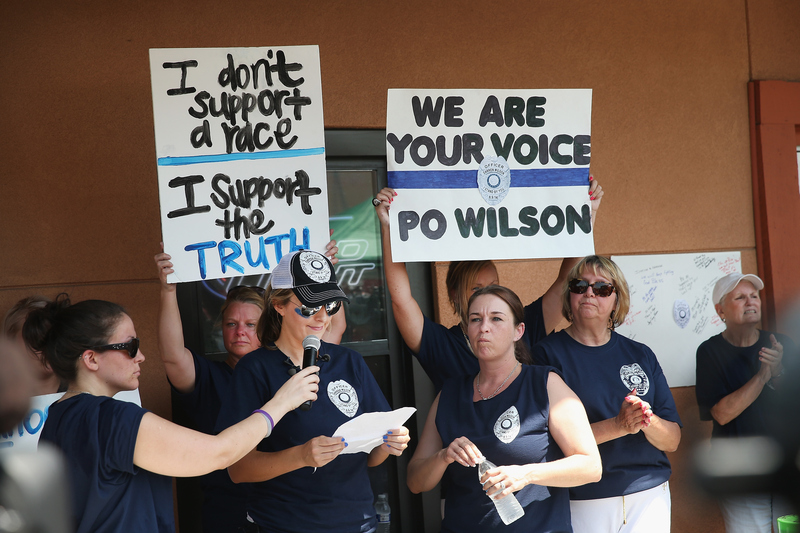 The administrators of the pro-Wilson gofundme page say they "anticipate these funds will be used to cover potential legal fees, relocation and living expenses of both Officer Darren Wilson and his immediate family." However, the online fundraiser has also drawn a litany of racist comments, forcing the administrators to shut down the comment section. The online support is also evident on Facebook, where a "Support Darren Wilson" community page has accumulated some 70,000 likes. On Saturday, CBS News correspondent Vladimir Duthiers reported there was a show of solidarity for Wilson with about 200 people gathering in downtown St. Louis. "I think he's been crucified, he's been accused of being guilty before a trial," one supported told CBS News. "That's not the American way." A grand jury is considering evidence in the case, and a federal investigation is also underway. Police have said a scuffle broke out after Wilson told Brown and a friend to move out of the street and onto a sidewalk in Ferguson. Police said Wilson was pushed into his squad car and physically assaulted. Some witnesses have reported seeing Brown's arms in the air - an act of surrender. An autopsy found Brown was shot at least six times. What are the next steps in the investigation of Ferguson police officer who shot Michael Brown? Not much is known about Wilson but snippets of his life have emerged. His parents were married only four years before divorcing in 1989 in Texas. Court records say he divorced last November. His mother, a convicted forger and alleged con artist, died 12 years ago. Wilson got a commendation in February from the Ferguson police force, four years into his job there. A longtime friend - former high school classmate and hockey buddy Jake Shepard - publicly has come to Wilson's defense, insisting in interviews that the shy Wilson would never maliciously take a life and fears possible retribution. Having talked to Wilson since the shooting, Shepard said, "I think he's kind of struggling a little bit, but I think he's doing OK."
"He didn't really want to talk much about it," Shepard, also 28, said of Brown's death. "But I can tell you for sure it was not racially motivated. He's not the type of person to harbor any hate for anybody. He was always nice, respectable and well-mannered, a gentleman. He doesn't have anything bad to say about anybody, ever. He's very genuine."